Unfortunately, this was the second of disappointing trips to Loving Hut. The first was in New York, right when they had first opened in February 2010. While it wasn’t horrible, it was not good enough to make me want to visit again, especially when there were so many other great vegan restaurants there. When they opened one in Orlando, I assumed it would be more of the same kind of food, and avoided it on my trips there. That is until some of my friends went 2 weeks ago, and came back raving about the food. I think they even went two days in a row! We happened to have back to back weekends in Orlando for friends’ weddings, and had some time to kill, so we decided to pay Loving Hut in Orlando a visit. It’s fairly close to downtown, right in the Vietnamese district there on Colonial/50. We went on a Sunday afternoon and they were busy setting up for the buffet, which starts at 3pm. Apparently the buffet is a big draw, because some people came in while we were eating that were all upset that it hadn’t yet begun, and left. So maybe we missed out too? It didn’t occur to me to ask my friends what they had ordered until after we got our food, so we picked a bunch of different sorts of things. First out were the Vegan Corn Dogs, $4.95, vegan dog with cornmeal. These were tempura dipped vegan hot dog pieces, contrary to the description that said cornmeal. I was bummed that they weren’t actual corn dogs. They were served with plain ole’ ketchup and mustard. They were okay. Next up was my Club Sandwich, $7.95, four slices wheat bread, tomato, pickle, lettuce, tofurky ham, ketchup, and vegan mayonnaise. I just had to have the club sandwich for some reason. This was one strange sandwich. We couldn’t figure out what this extra texture in there was until I pulled one of them apart to discover the secret. Apple slices! Odd. It was a very sweet sandwich overall, from the OVERLOAD of sweet mayo (I like mayo, but the amount was grossing me out), sweet ham, sweet gherkin, and sweet apple. I pulled the apple slices out, and ate them separately. I also did my best to scrape off the crazy thick mayo. It was much better after this, but still not something I would order again, and definitely not what I had in mind. 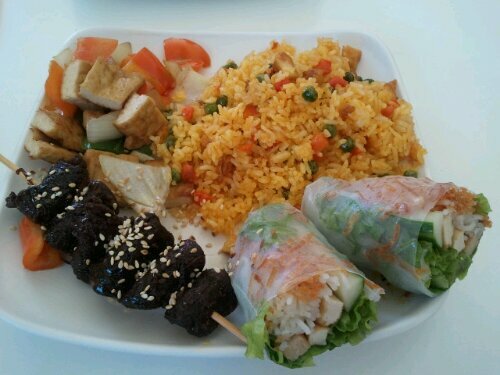 Thomas ordered Combo #3, $8.95, rice, fresh spring rolls, BBQ and tofu. He figured the best things to order would probably be what seemed to be their specialty, Asian food. I was also really curious to try the BBQ (soy protein, lemongrass, sesame seeds and seasonings, onion garlic and five spice.) Right away he went in for the BBQ, and frowned because it was overcooked and tough. I took a bite too. It sure was tough! The flavors were really good though. The rice was fine, and the spring rolls (rice noodle, vegan ham, tofu, cucumber, salad, potato chips), served with peanut sauce, and were alright. Though they lost what’s so nice about a fresh spring roll by putting all the processed fried stuff in there. The tofu was also overdone, but still tasted okay. I had also ordered Sesame Sushi, $6.95, cucumber, fried tofu, vegan ham, carrot, rice, sesame, wrapped with seaweed, avocado, as the safe option. It was kind of like the spring rolls. Just okay, and with a weird combination of stuff. They weren’t rolled very well, and fell apart when you tried to pick them up. Thomas had pointed out to me that they had flan in the desserts right away, so I couldn’t leave without trying it. I knew it probably wasn’t going to live up to my expectations (I’m Cuban, after all) but had to do it, just in case. Worth mentioning is that I’ve tried to make vegan flan a couple of times and they’ve been miserable fails that were immediately thrown away. So yah. This is probably my last trip to Loving Hut. Nothing tasted very fresh, and it was all just sort of okay. I mean, if I was in a place where there were no other place where I could get a decent meal besides LH, I’d probably give them another chance, but that would really be the only scenario. At least this time the infomercialy looped [Supreme Master So and So] TV that they play didn’t show too many animals in slaughterhouses like they did that time in NYC. (I get it, but it’s not very appetizing.) The service at this particular location was exceptionally slow, and most of the time, we were the only people in there. I almost forgot to mention it, but I just went to read the other reviews on HappyCow.net and was reminded! If you’re in the area, I suggest that you take a look in at some of the other [Vietnamese] places on that street instead. We ate at one of them about a year and a half ago, and it was AMAZING. They had really nice fresh food that was well prepared, a vegetarian menu , and super delicious fake meat. Or you could drive a little further and try your luck at Ethos. You mentioned there were a lot of good vegan places in NY – I’m going there next weekend for the first time. Any I should make sure to stop in at (other than the famed Babycakes which is already on the list)? You will certainly enjoy Babycakes if you love sweets! I have links to some of my fave restaurants in NYC on the right side of the blog. You should definitely pay a visit to Candle 79 for top tier vegan food at it’s finest. It’s pricey and fancy, but you can also go to Candle Cafe which is right around the corner. They’re both by the Met too, if you’re hitting up the museum. 79 has brunch. If you go to either one, you MUST try the seitan chimichuri skewers! I love angelica kitchen. It’s macrobiotic, if you’re feeling like cleaner food. I love the Sam or I sandwich and the mole burrito. If you want vegan junk food and find yourself in Brooklyn, go to Foodswings. It’s worth making the trip to Williamsburg just for the drumsticks! I’m not sure there is better vegan chicken anywhere. I love the southern style BBQ ones. Try searching NYC vegan on my site (search bar in top right corner) for more in depth reviews, and/or click the nyc vegan restaurant tag.